Why Create a Related Links Box? After you’ve created content for your website, you can add a box at the end of your article to suggest “related links” that a reader might wish to look at. Clicking on one of these links will take the reader to other associated pages on your site. They allow users to navigate your website and see what other content is available. This, in turn, helps them know you better and understand what you have to offer. Better yet, the longer a visitor engages with your site’s content, the greater the chance that you will be able to convert that reader into a client, patient, or customer. They help establish information hierarchy for a given website. Along with other design elements—headlines and subheadings, text and white space, graphics and video—specialized sections of a web page subtly teach the reader about relationships between ideas. A “related links” box is clearly subsidiary to the main article, but it also signals the breadth of knowledge at the site owner’s fingertips. They help Google to “crawl the site” and index your website pages effectively. This is essential to getting your site listed in the search engine results for the ideal clients or patients you want to find you. They can help you promote events, books, reports, and freebies. These links can direct users to other valuable services you may be offering. These instructions assume you know how to create a hyperlink. You should have these hyperlinks created before you start, so they’re ready for you to copy and paste into your table. 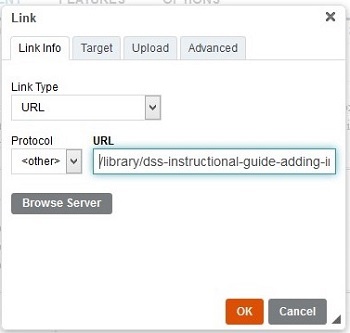 Step 1: Log in to DSS, and display the content where you’ll include the Related Links box. Tip: You can use the Search and Edit option under any of the site content topics to find the content you’re looking for, or you can use the orange Search Items magnifying glass icon at the left side of the screen. Step 2: Once the desired content displays, place your cursor after the punctuation of the very last sentence. Step 3: Press Enter. The table will be inserted at the bottom left of your article. Step 4: Under the Rich Content Editor, click the Table icon. This icon is designated by a picture of six small squares. If you mouse over the icon, the word “Table” displays. 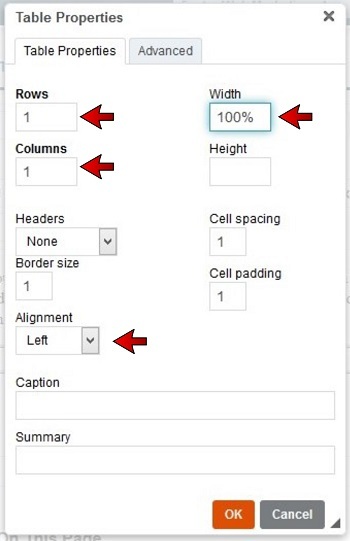 Step 5: In the Table Properties dialog box, enter 1 for Rows, 1 for Columns, 100% for Width, and set Alignment to Left. Step 6: Click the Advanced tab. 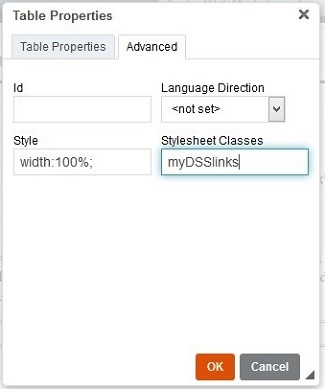 Step 7: In the Stylesheet Classes field, enter: myDSSlinks. Make sure you get the capitalization exactly right. Step 8: Click OK. The table—a simple rectangle—is inserted at the bottom of the article. Step 9. Copy the links content you want to use, and paste it into the table. Before you test the related links, you should edit them. It’s more efficient to use what are called relative links to jump from page to page within your own website, in place of the natural absolute links that are used elsewhere. In addition, converting your related links to relative links will greatly speed up reorganizing your website in the future, or even moving all the content to a new site. Step 10: Right-click on a link, and choose Edit Link from the menu. 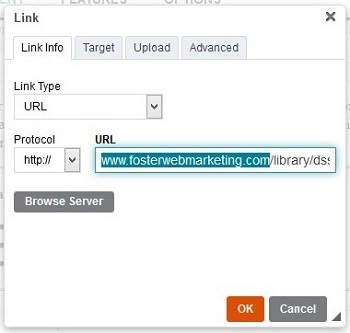 Step 11: In the URL field of the Link box, select the name of the website. Highlight everything up to (but NOT including) the first slash mark. Step 12: After you select the website name, delete it. Just the location of the information within your website should be showing. Be sure that the slash is included at the front of the location name. (The content of the Protocol box automatically turns to ). Step 13: Click OK. Do this for each of your links. Step 14: To test your links live, click SAVE at the top right of the screen. As always, Foster Web Marketing is dedicated to your success. If you need any help or feel something is not working properly, please contact us by using the DSS Need Help button, by emailing [email protected], or by calling 888-886-0939. We will be happy to assist you!